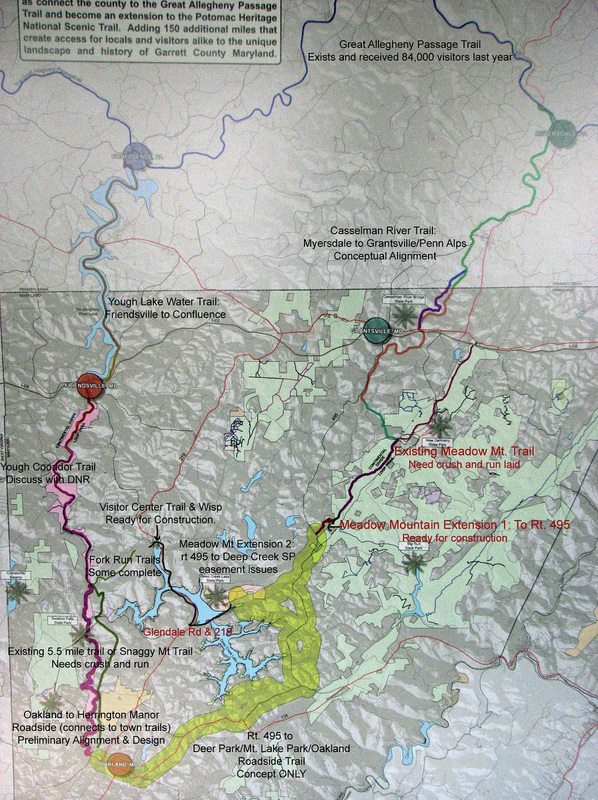 Our main focus has been a 150 mile, multi-surface, multi-user trail, named the Eastern Continental Divide Loop Trail, named for its eastern leg running along the Eastern Continental Divide at Meadow Mountain. This trail connects state parks and forests with population centers in addition to connecting our loop with the Great Allegheny Passage (GAP) to our north. What is the Eastern Continental Divide Loop? In October of 2010, the Department of Natural Resources hosted the first ever Maryland Trails Summit in Baltimore, MD. Governor Martin O’Malley expressed a strong desire “…to make Maryland’s trails system second to none in the nation.” It stands to reason that Garrett County will play a huge role in this vision. Garrett County’s state parks, forests, and wildlife management areas assist in the preservation of approximately 20% of the total acreage of the entire county. While this figure is impressive, the key to taking this network to the next level is connectivity. 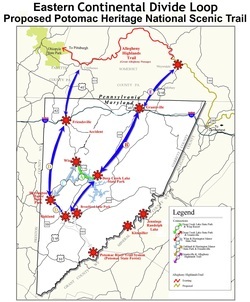 Since 2002, Garrett Trails has been focused on the proposed “Eastern Continental Divide Loop” which is envisioned as a 150 mile hard-packed, multi-user trail through the heart of Garrett County that bridges the connections between existing trails and also connects to larger trail networks outside the county. While Garrett Trails has worked to establish bike lanes and Share the Road designations, the Continental Divide Loop will increase safety to trail users by relocating them from along the county’s busiest roadways to a network of safe travel opportunities and alternative paths through public land. 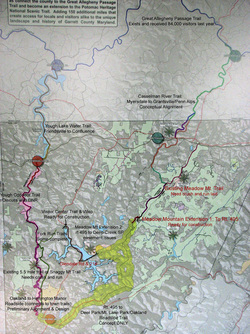 Connections between existing recreation areas such as Fork Run and Herrington Manor increase user safety while promoting hiking, biking, walking, backpacking, trail running, cross country skiing, and educational study. Substantial impact can be seen when trails are bridged and each smaller system becomes a potential stop on a larger loop trail. The Great Allegheny Passage, which the Continental Divide Loop will connect to, is now drawing thousands of hikers and bikers each year. An economic impact study of the GAP found that over $40 million in annual direct spending and another $7.5 million in wages is directly attributable to the trail market. Job creation and financial impact stems from hikers and bikers stopping for lunch, picking up spare gear, and staying the night at any number of businesses located near these trails. A comprehensive trail system in Garrett County will become an indispensable asset by recruiting new businesses to the county, providing better quality of life for both residents & visitors, while increasing exercise opportunities, providing new employment and bringing in additional tax revenue. These interconnected trails will lead to more trail users and expanded monitoring of trails for illegal or harmful use. Safe and popular trails are good for Garrett County by promoting fitness and outdoor enjoyment, in addition to spurring significant economic development by attracting new visitors and residents. With your help and support, Garrett Trails will continue to work toward creating a well-used network of outstanding quality trails that provide access to Garrett County’s historic, municipal and environmental treasures and that link to trails outside the county. This northern portion of this loop leads from the Casselman River, through Grantsville, MD, across the MD/PA border and eventually connects with the Great Allegheny Passage at Meyersdale, PA. This existing Allegheny Highlands Trail forms a loop at Confluence, PA where it can be taken back down to the southern portion of the loop beginning at Friendsville, MD. Continuing south, the user reaches Herrington Manor State Park or farther south into Oakland, MD. Passing Swallow Falls State Park, the trail would briefly follow the Youghiogheny River and then pass the Deep Creek Hydroelectric Power Plant to the Fork Run Trail System. From here, the Chamber of Commerce/Visitor Center is accessible along with Deep Creek Lake State park via bike lanes along Route 219. Finally, the loop will follow the Meadow Mountain Trail north back to Grantsville, MD. 25% of hospitality and leisure businesses adding at least one position. 2 to 5 new businesses being started. Given the recent study of the economic development impact of the GAP, we anticipate seeing the impact on jobs within 2 years of the completion of the trail. The trail system will be an effective tool for recruiting new businesses and vacationers to the county. It will be an asset to the county by providing better quality of life for both residents & visitors, while increasing business opportunities, providing new employment and bringing in additional revenue. Garrett Trails has contacted the Pennsylvania towns of Confluence and Myersdale as well as the commissioner in Somerset County, PA about current trail segments that are in PA. All of those contacted are excited about the potential for a trail connection between Somerset County, PA and Garrett County, MD. Garrett Trails also works with the National Park Service, National Potomac Heritage Scenic Trail division and as of December 4,20015, designated the ECDLT as a part of the National Scenic Potomac Heritage Trail.